Diammondback’s Haanjo transcends categories. Equipped with a lightweight 6061 T-6 Alloy Frame, the bike has all the virtues to become a racing machine while having the features and strength of serving as a perfect mountain bike and it is this combination that makes it “sui generis” – unique. The frame of this bike has been designed with Diamondback’s Enhanced Performance Geometry which focuses on performance, ease of handling and comfort of it riders. The ride quality offered by this bike is top-notch and whether you are looking for a bike to work, hit the gravel or cruise around the town or city streets, this bike has much to offer to you in all those fronts. It comes with disc brakes which have several advantages. The force of braking offered by the disc brakes is far superior. They also outperform their rim brake cousins in terms of braking quality in wet and muddy conditions. The bike has a very stylish look which is bound to impress you. 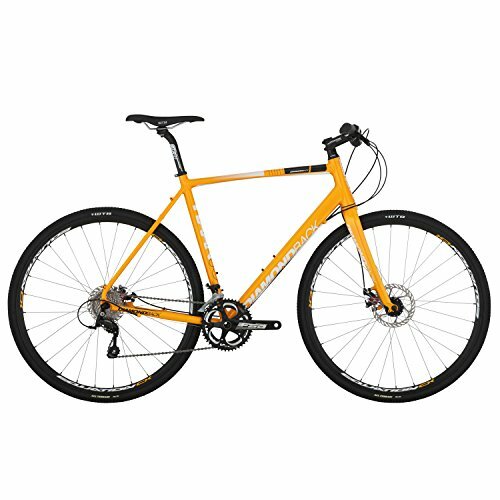 It offers to you a complete package of performance, style, comfort and endurance with a lucrative and lowest possible price tag and if you are looking for a bike which can be your companion for getting to work, hitting the muddy roads or going for weekend rides, this bike is your best option. The Diamondback Haanjo Alternative Road Bike comes with Fully Butted DB Road 6061 T-6 Alloy Frame with EPG(Enhanced Perfromance Geometry); DB Road Disc Carbon Fork with 1.5 inch Alloy (Tapered); FSA No. 42 Headset; FSA Gossamer Cranks; Sealed Cartridge Bottom Bracket; Shimano Sora 31.8 Front Derailleur; Shimano Sora 9 speed Rear Derailleur; Shimano 9-spd Flatbar shifter; Shimano HG-50 Tiagra 9 speed Cogset; KMC Z99 Chain; 28h Alloy QR Disc Front Hub; 28h Alloy Cassette QR Disc Rear Hub; 14g Stainless Steel Spokes; New DB Equation CX 23 millimetre Wide Road Rims (28H Front and 28H Rear); WTB All Terrain Tires (700x32c); Avid BB5 Disc Brakes (160 millimetre Front Rotor, 140 millimetre Rear Rotor); Avid FR5 Brake Levers; DB 31.8 millimetre No-rise Flat Handlebar; DB4L 135 millimetre Kraton Grips; DBR 3D Forged Stem (+/- 7o, 31.8); DBR Performance Post Seat post with Alloy Micro-adjust (27.2 millimetre) and WTB Silverado Comp. Seat. The Diamondback Haanjo Alternative is a road bike which can be used for commuting inside the city, hitting the gravel and for weekend rides. The bike comes with a lightweight alloy frame which makes it fairly easy to handle. The Shimano Sora shifters are nice and smooth and offer efficient gear shifting. It comes with disc brakes which function well and provide ample braking power to stop the bike in time. 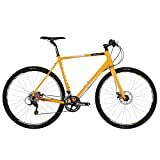 The bike does not ship assembled and it is recommended to take to your local bike shop to get it set up properly. The gears, brakes and hubs require some tuning before you start riding it. Ride quality offered by this bike is extremely smooth and immense fun. The bike has been designed with Diamonback’s Enhanced Performance Geometry which offers a comfortable ride. Overall, the bike performs equally well on the gravel as well as on the streets. Each component of this bike does its work fairly well. The wheels are pretty strong and offer durability. The tires are also ready to take on the muddy roads and the gravel. The bike comes at a reasonable price and if you are looking for a multi-utility bicycle which offers smooth ride quality and has the ability to handle the gravel efficiently, this one can be your perfect choice.